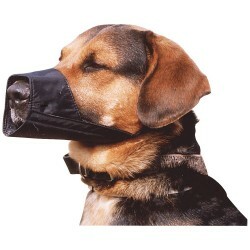 These muzzles were developed in New Zealand to solve the problem of dogs working in industrial situations, such as freezing works, where they are encouraged to make a lot of noise, but can not be allowed to bite. The solution was this extra heavy duty "industrial" muzzle. Made out of stainless steel rod and heavy duty vinyl coated webbing, they fit the dog snugly and comfortably. 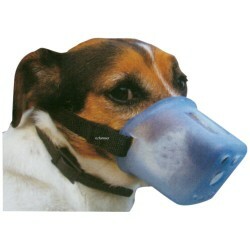 After a little introduction, most dogs happily wear the muzzle all the working day. The dog's barking and drinking ability are unaffected. 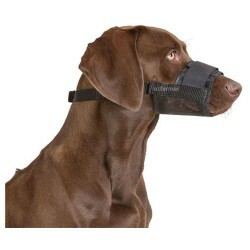 In fact, it seems their inability to bite whilst wearing the muzzle, actually encourages their barking. 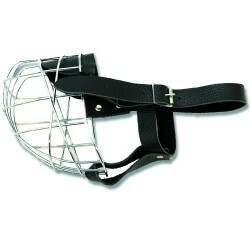 These muzzles will last the life of most dogs. 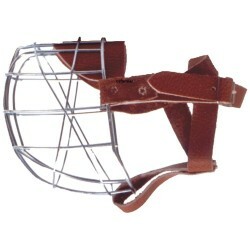 Weight 330gm (medium muzzle). Dimensions are maximum nose circumference (at nose bridge) and length from nose tip to circumference point. 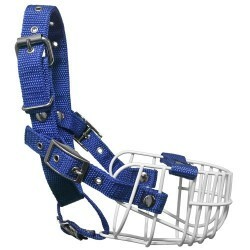 Lightweight Sheep Dog Muzzle Lightweight muzzle specially designed for Australian workin.. 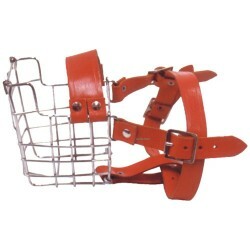 This is the classic muzzle for Australian cattle dogs, being slightly wider than normal sheep dog m..
More and more conscientious dog owners are using muzzles to ensure their dog is not caught behaving .. 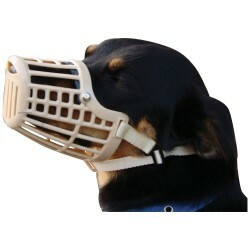 This muzzle looks ´doggy´ and allows your dog better breathing and cooling than some kinds. Dark br.. 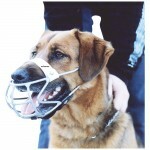 The safe-handling dog muzzle has been designed primarily for use by animal-handling professionals su..